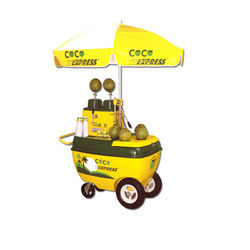 Leading Manufacturer of coco express cart from Hyderabad. With the help of our diligent workforce, we are capable of offering our customers with a wide range of Coco Express Trolley, which is manufactured using high-quality stainless steel and fiberglass. This express has a matching umbrella attached to it and a tap for coconut water. Looking for Coco Express ?